You know how I always think twice before I throw something out. Hmmm...can I use this for something else? 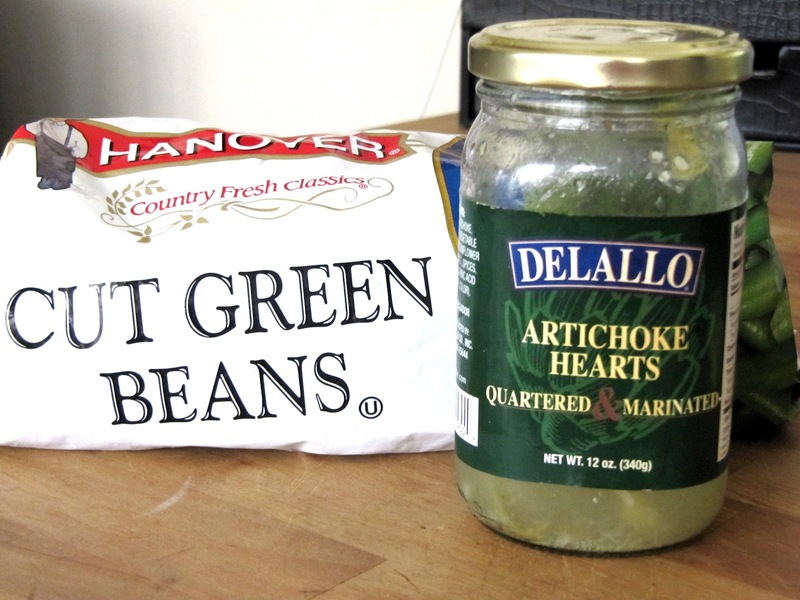 Well, I had an idea for a jar of marinated artichoke hearts. 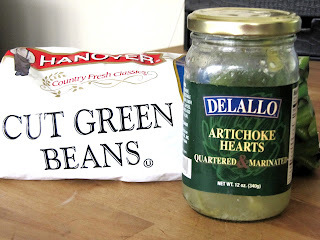 When I finished the artichokes, there was still all that yummy marinade in the jar. 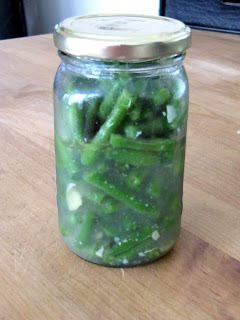 I had frozen green beans in the freezer, so I thought I would give it a try. Yup...delish!! They are great in salads too. I didn't even cook them. Just threw them in the jar frozen and stored them in the refrigerator to marinate for a few days! I did add a little more vinegar and crushed garlic. Give this a try with other veggies too!! Being a Frugal Fanny isn't just for crafting! If you like cauliflower (which we do around here) that is awesome done this way too! Well Karen, imagine my surprise when I saw your post. I jumped back to your "About me" page because I did not think you were a local girl. You see, Delallo's is a local brand here in the Pittsburgh area. I live a few minutes from the Mother store. In fact, Mrs. Delallo has given me cooking tips in the past. Small world. gotta love those artichokes. The store is amazing as well. Thanks for the tip...I'll be trying this one! Whoo Hoo! This sounds great, and I always shed a tear when pouring that great marinade down the drain. Thanks for the tip! For years, I've been adding a can of sliced beets to leftover dill pickle juice. 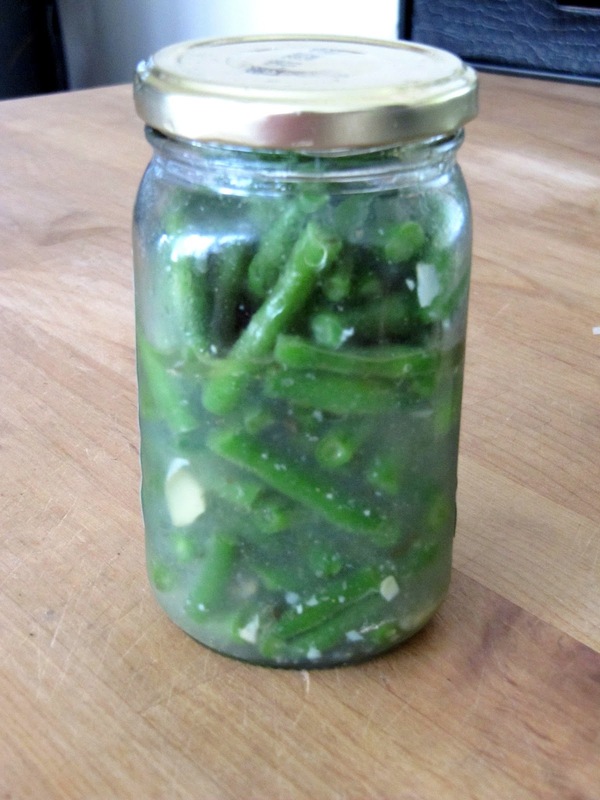 Haven't tried green beans yet, so thanks for the idea. And yes, DeLallo is THE favorite of the 'Burgh. When the ranch dressing bottle is getting low, I add apple cider vinegar to the bottle and shake it really well. It loosens the dressing that likes to cling to the bottle and helps me use every bit. If it is too tart, I add a bit a sugar. What a great tip! Thanks, I will be trying this as soon as the jar is empty! Sounds like something new to try :) Thanks for the tip! My grandfather used to do the same thing with pickled beet juice. I always considered it more of a science experiment than a dish. Now if he had had something nicer like your marinade, I would have been a little more impressed. My dad used left over pickle juice to "pickle" many other things. I had forgotten, but it is a great idea. OMG We have an empty jar of marinated artichokes at least once a week. I too have tried to preserve using it with "something"!! Now because of your tip, I will try the green beens. I do use my pickled beet juice to make picked hard boiled eggs. Can't remember what they call them in PA, but it is a special favorite of that area. lol I thought I was the only one in the world who did stuff like this! I put sliced celery and carrots in the pickle juice for a few days for pickled salad, add milk to ranch salad dressing to get the last little bit out of the bottle (and this is homemade dressing so you know I'm not wasting a bit!) I don't think of myself as cheap just husbanding resources.